The unrest began on the evening of October 7, when around 400 Kurds gathered outside the Al-Nour mosque near the central train station in Hamburg's St. George district to protest against IS attacks on the Syrian Kurdish town of Kobani. "I had the feeling that we are living in Hamburgistan," the imam of the Al-Nour mosque, Daniel Abdin, told the German newsmagazine Der Spiegel. "The atmosphere was very, very explosive." In an interview with the newspaper Passau Neue Presse, the chairman of the German Police Union, Rainer Wendt, reported that police in Hamburg "experienced life-threatening brute force" by perpetrators who were armed "to the teeth." Wendt warned that the IS-Kurdish conflict is "threatening to unleash a proxy war on German soil." 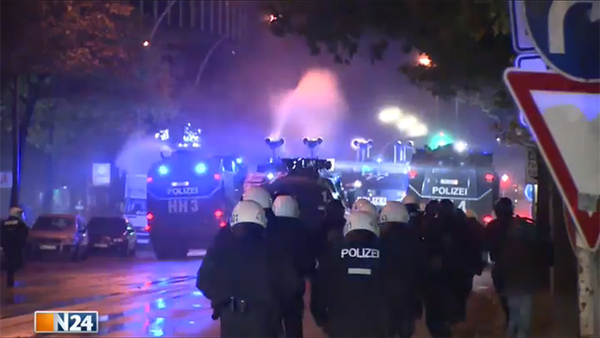 A police official in Hamburg, Gerhard Kirsch, said the level of the violence points to a new "dangerous dimension" that "we have so far not seen at other demonstrations." "If in the middle of Hamburg 800 hostile people are fighting each other with machetes, knives and iron rods, there must be consequences for the perpetrators. Politically motivated extremists and religious fanatics have brought a conflict to Hamburg that cannot be solved here." "Solidarity with Kobani" demonstrations have also taken place in Munich—where protestors waving large Kurdish flags occupied the offices of the Christian Social Union [CSU], the Bavaria-based sister party to Germany's ruling Christian Democratic Union party [CDU]—as well as in the western German cities of Berlin, Bremen, Göttingen, Hamm, Hannover, Kiel, Oldenburg and Stuttgart. The overall aim was to "protect our population" by exporting the problem, the head of counter-terrorism for Bavarian Police, Ludwig Schierghofer, told ARD. The reasoning was "to bring those persons who pose a risk that they will commit terrorist attacks outside of the country," he said. "If someone had become radicalized and wanted to leave, then the policy was to allow them to leave or even accelerate their departure by various means." "I am not afraid, but I have become more careful," says Huch, who now receives police protection. He says he has altered his daily comings and goings in order to be less predictable. Among other lifestyle changes, he has cut out regular visits to restaurants, pubs and other public venues. Another politician, Ismail Tipi of the ruling CDU, is paying the price for criticizing the rise of Salafism in Germany. "I receive threats almost every day," Tipi says. "The death threats against me have no limits. The Salafists want to behead me, shoot me, stone me, execute me and they have many other death wishes for me." According to CDU official Wolfgang Bosbach, politicians who receive death threats should not allow themselves to be intimidated. "Under no circumstances should they give in and change their stance, otherwise the extremists will have achieved their objectives." The head of the FDP, Christian Lindner agrees. "It is unacceptable for Liberals to allow religious extremists to take an ax to the central values of our constitution. We will not give in to threats and intimidation, rather we will demand the determined reaction of the rule of law." "The violent clashes between Kurdish and Islamist groups in German cities and on German streets refer more to internal German problems than the situation in northern Syria and northern Iraq. "As a society we must ask ourselves: how can it be that people who live in Germany and in large part are born and raised here, are supporters of a brutal, inhuman and fundamentalist terror group such as the IS and attack peaceful protestors with knives, sticks and machetes. Here in Germany, the IS threatens to become a refuge for frustrated young people who lack future prospects."